2. Put 100g (3.5oz.) of cooked white Japanese rice in 2 bowls. Mix in Green and Blue Rice Sprinkles. 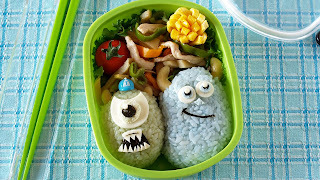 Use plastic wrap and form the rice to make the face of Mike and Sulley. 3. Cut out the blue and green sheets of egg to make their eyes. Cut out Nori sheet and sliced cheese to make their face parts. Attach them with bits of mayonnaise with tweezers.